UML class diagram example of Aladdin package classes implementing Sentinel LDK 6.1 Licensing API. 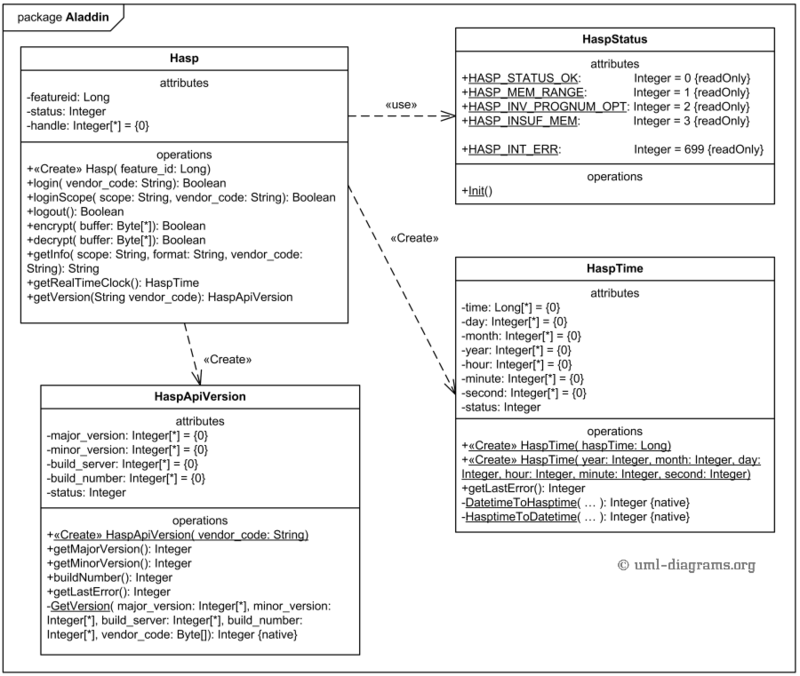 This is an example of UML implementation level class diagram which shows HASP classes included in the Aladdin package. These classses represent implementation of the HASP Java Native Interface Proxy component you can see on the Sentinel HASP licensing component diagram. Aladdin package provides Java interface to the native library implementing Sentinel LDK 6.1 Licensing API. Class diagram for Aladdin package implementing Sentinel LDK 6.1 Licensing API in Java. HASP Java API includes 4 Java classes: Hasp, HaspApiVersion, HaspTime, and HaspStatus, all part of Aladdin package. Those classes are bundled into HASPJava.jar artifact. The HASP Java API classes load and link native methods from a platform-specific native library. The main class of the HASP Java API is Hasp. This class allows to login or logout into software protection key for specific vendor key or scope (see Sentinel HASP domain), encrypt or decrypt some license data bytes, get information about protection key, real time clock, etc. This class uses HaspApiVersion, HaspTime, and HaspStatus classes.